We here at beatlesblogger have just discovered that a fantastic Australian theatrical production about the life and times of John Lennon has just hit New York. John Waters is one of Australia’s most respected and talented actors. He and his musical director Stewart D’Arrietta have been performing and perfecting their stage presentation about John Lennon since the early 1990’s. Over that time it has been rested, revived and revised many times – and at each new outing the show has always been met with great critical and audience acclaim here. Waters and D’Arrietta have been on the road throughout 2014, playing Lennon in cities and towns across Australia – so it’s great to see that the pair have now made it to the Big Apple after all these years. Tickets are reportedly selling well, and the show is getting some good media coverage in the city. In Australia the show is known as Looking Through a Glass Onion – John Lennon in Word and Music, so it’s interesting to note the slight name change for the US premiere and also that John Waters is billed as John R. Waters for American audiences. We guess that’s so he’s not confused with the well-known US writer and film director of the same name. 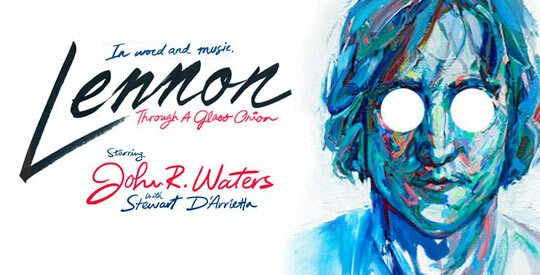 Lennon: Through a Glass Onion is playing now at the Union Square Theatre in New York. It has a good run with performances booked through to February next year. There’s a dedicated website for the New York Union Square Theatre shows with more details on the production, and there’s also a Facebook presence. Performances take place now through February 28 at Union Square Theatre, 100 East 17th Street, New York, NY 10003. For a special limited time discount code offer to Beatles Blog readers click here. This entry was posted in Beatles, Beatles Music, Beatles Related, John Lennon and tagged Beatles, Beatles Related, John Lennon, John Waters, Lennon: Through a Glass Onion, Looking Through a Glass Onion by beatlesblogger. Bookmark the permalink. I went to see this show when it was in Adelaide (knowing Waters as Darcy in Offspring), and it was FABULOUS! One of the best nights in my (admittedly short) life. Congratulations to him and D’Arrietta for making it to New York, the other home of that magical man whom the pair are paying tribute. They deserve it. You can see a lot of videos. Hope you like them too.